With its sheer variety of landscapes and places to visit - from rolling moors to beautiful beaches, cathedral cities and quaint villages - it’s easy to see why Devon is much-loved by holidaymakers. Although some parts can be very rural, it is possible to enjoy a car-free holiday and still take on some of the best walks the county has to offer. Whichever part of Devon you choose to visit, there are a variety of great walks to be had, showcasing the best of town, country and coast. The more rural half of the county, North Devon, is largely unspoilt and offers charming market towns, scenic coastline and an abundance of natural beauty with the Exmoor National Park. With just one train line connecting Barnstaple with Exeter, the vast majority of the time you will need to use buses to travel about. The Tarka Trail is a largely flat walking and cycling trail, extending 30 miles from Meeth to Braunton. It mostly follows the course of the rivers Taw and Torridge, with some great coastal estuary views and plenty of places to stop along the way. Walks can be broken up into smaller sections, with buses operating to Meeth, Great Torrington, Bideford, Instow, Yelland, Fremington, Barnstaple and Braunton. The wild beauty of Exmoor especially shows in its coastline – quiet, unspoilt and breathtakingly beautiful – and this epic walk from Combe Martin to Lynmouth is the perfect way to take it all in. Buses serve both Combe Martin and Lynton/Lynmouth, meaning you can choose to start at either end. Along the way you’ll tackle the highest cliff in Britain, the 244m-high Great Hangman, and take in beauty spots such as Heddon’s Mouth and the Valley of Rocks. Starting and ending in the popular town of Braunton, reachable by bus from Barnstaple and Ilfracombe, this walk first follows a country lane through the Burrows before reaching a long and gorgeous stretch of sandy beach. First you’ll discover Crow Point, with its distinctive lighthouse, before reaching the amazing Saunton Sands, where you could also stop for a bite to eat at the hotel. East Devon is home to a number of pretty seaside towns as well as a stretch of the UNESCO World Heritage Site, the Jurassic Coast. Nearby Exeter also offers plenty to see for those seeking some city sightseeing. This 3-mile walk takes in many of the sights of central Exeter, starting in the delightful quayside area. Partially following the ancient city walls, you’ll walk past the towering cathedral, as well as Northernhay Gardens, with its Norman castle. This walk avoids the hustle and bustle of the main shopping areas while taking in some of its prettiest buildings. Exeter can be easily reach by train or bus from a variety of destinations. The World Heritage Site of the Jurassic Coast stretches from East Devon through to Dorset and offers a spectacular coastline rich in fossils. 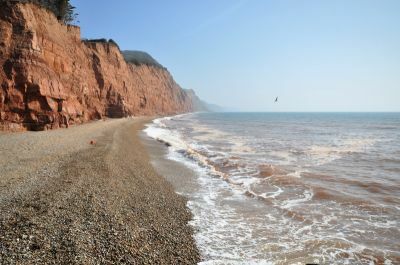 Starting in Sidmouth, there’s a few steep cliffs to climb on this 8-mile-long walk, meaning it’s not for those seeking a leisurely stroll. The views from the top are magical though – you’ll be able to see around you for miles. Once you’ve arrived in Seaton, buses operate regularly to take you back to Sidmouth. 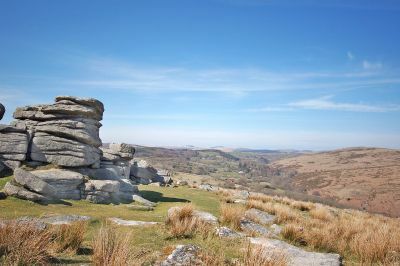 A beautifully remote part of the county, Mid Devon is home to a host of rewarding walks, especially within the stunning Dartmoor National Park. Trains serve Exeter, Newton Abbot, Ivybridge and Plymouth, with a summer seasonal service round the north flanks of Dartmoor to Okehampton. Haytor is one of Dartmoor’s most popular spots, with the gigantic Haytor Rocks crowning the tor’s summit. This walk encompasses not only this much-loved beauty spot but also a former granite quarry, which operated during the 19th century. It follows the Haytor Granite Tramway, built to guide the wheels of horse-drawn carts. During the summer months, the Haytor Hoppa bus operates from Bovey Tracey and Newton Abbot. Starting in the village of Sticklepath, this walk is a great way to explore northern Dartmoor, taking in open moorland, a woodland cleave and a few small fells. Also known as Cosdon Hill, Cawsand is one of the highest points on Dartmoor, with excellent views once you’ve taken on the climb to the summit. Little Hound Tor is a little less challenging and is crowned with the impressive White Moor Stone Circle. Buses from Okehampton and Exeter travel to Sticklepath. Home to its own Area of Outstanding Natural Beauty, South Devon has much to offer, from pretty beaches to fishing towns and the maritime city of Plymouth. While a train line runs between Plymouth and Exeter, for the most part the bus is the only public transport option. This walk is a great way to see the main sights of this coastal city, from 16th and 17th century buildings in the city centre to the spectacular Smeaton’s Tower on Plymouth Hoe. Starting at the University, the walk takes you through the city centre, up to Plymouth Hoe and along the coast round to the lovely Barbican area. Starting in the lovely riverside town of Dartmouth, this walk takes you through some wonderful South Hams scenery, with the end destination being the golden sandy beach of Blackpool Sands. Following the Dart estuary and the South West Coast Path, this 10-mile walk also takes you through the National Trust site of Little Dartmouth. A Stagecoach bus service runs regularly between Dartmouth and Blackpool Sands, heading onwards to Kingsbridge. Words and photos by holidaycottages.co.uk – offering more than 3500 holiday cottages across the UK, with a huge choice available in Devon.